The LG GP08NU10 is an external CD/DVD recorder, which is only powered via USB and comes without a power adapter. 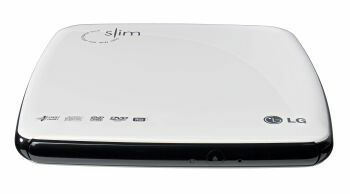 Due to its compact size it is a good supplement for netbooks or compact laptops, which do not provide an optical drive. 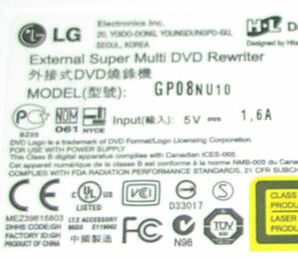 Generally the recorder is nearly identical to the GP08LU10 or GSA-E50N – it only lacks support for LightScribe, instead the device is advertised to be compatible with MACs as well. Officially, the GP08NU10 is “bus powered”, which means, no separate power adapter is provided – although there is a connector for an optional power supply using a second USB cable or a stabilized power adapter. The recorder needs 5 V at 1.6 A or up to 8 W. But USB 2 just has to provide 0.5 A maximum or 2.5 W at one port, if a device requests it. Even when using the provided cable for the power supply using a second port, this is only 0.6 A maximum or 3 W, because the recorder does not register itself at the second port. Even when we assume, that 0.5 A are drawn from the second port, disregarding the standard, there are still 0.6 A or 3 W missing for proper operation. Although the recorder worked fine on a netbook as well as on a PC – how is this possible? Probably several things are relevant here. The specified power requirements are a maximum value, which is obviously not always needed – specially read operations need much less power and even when writing data, the maximum power is not needed all the time. Additionally, LG mounted a big “supercap” capacitor, which is charged when turning on the device, and then acts as an additional power source. This makes the recorder work without a separate power adapter solely connected to a USB 2 port. However, if there are problems due to the power supply, you can still use a stabilized power adapter. The recorder was recognized on a netbook (Samsung NC10) as well as on a PC under Windows XP automatically and was useable without any driver. 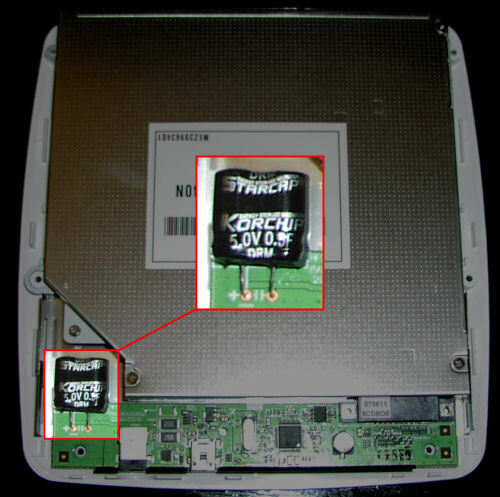 On the netbook booting from CD or DVD was possible without any noticable problems. 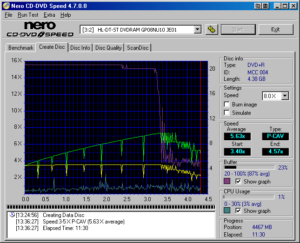 On the PC there where drivers installed to provide UDF support for DVD-RAM, which actually where intended for a Panasonic SW-9574C, but they also worked with the GP08NU10 – a “bare” DVD-RAM media could be read and written without any problems. 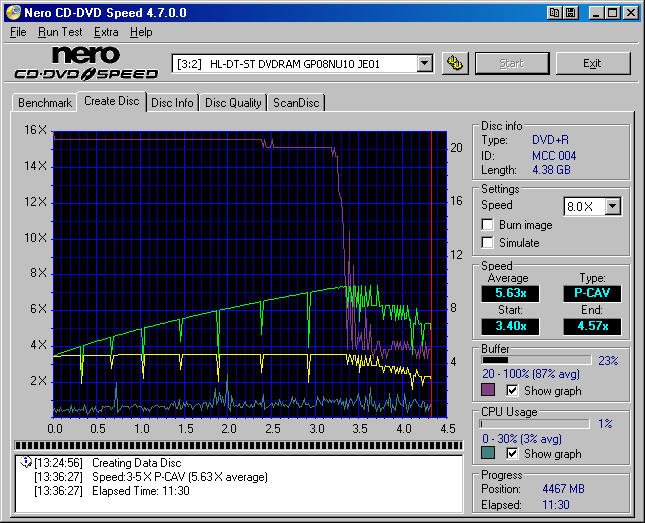 Burning CDs and DVDs also worked without any noticeable problems via USB only without any additional power supply. Software for Windows is provided – a OEM version of Nero Burning ROM and Cyberlink DVD Suite, which containts PowerDVD and PowerProducer (you can choose, which programs to install, so there is no need to install the whole package if you just want to use Nero Burning ROM). As i don’t need the “SecureDisc” function i did not test it. Very positive: When playing back commercial video DVDs with CSS the speed will be reduced automatically, which causes a much quieter operation. Reading a CD and a DVD-R does not show any noticable problems. The speed gradient is typical due to the constant rotational speed of the drive (CAV – constant angular velocity). 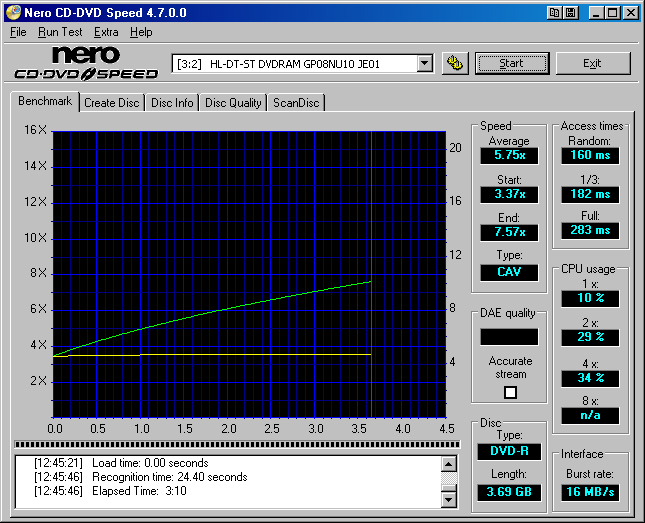 When writing a DVD+R the limits of the USB interface become clearly visible – above about 7x or approximately 9 MB/s the speed decreases considerable. Anyway, the media was written without any errors. The total duration of 11:30 minutes equates to an average speed of about 5x for the whole media. The recorder is not very fast – but it works reliable anyway. The LG GP08NU10 is very compact and light and the ideal supplement for netbooks to install additional software easily or to boot recovery media – USB sticks are sometimes a bit problematic. Due to its compact size and the low weight it can also be transported very easy compared to 5.25″ drives. Only the price of about 70-90 EUR (beginning of 2009 in Germany) seems to be a bit expensive when compared to regular recorders, which cost less than half and are much faster. On the other hand you have to consider, that this is a slimline drive with a special chassis and software and not just a “bare” internal drive without any software and cables.